One of our favorite accessory makers, Twelve South, has just released two new color selections for the Compass stand for the iPad and iPad 2. In addition to the raw, silvery aluminum Compass stand, a hot looking candy apple red and stealthy black colors now accompany the heavy gauge steel easel stand. 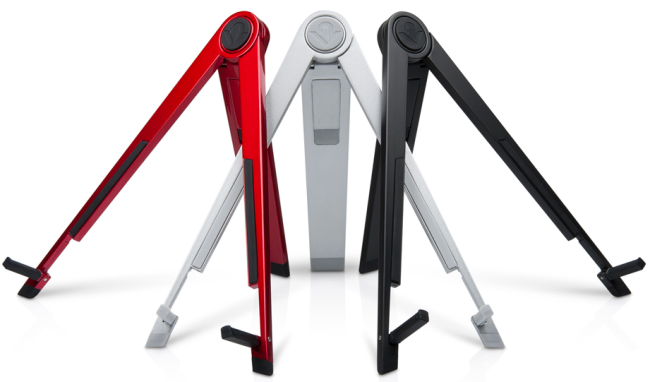 The pocket sized Compass stand folds open to let you set your iPad, or iPad 2 in various different angles. And it also doubles as a typing workstation. See it in action in our full review right here. The new color additions will look great against the back aluminum of the iPad and iPad 2, and even pop more if you've got a white iPad 2. Twelve South's Compass is available now in all three colors for $39.99.